For me the Internet is one of the greatest tools for searching news and making connections with other anglers around the world. As a writer and blogger the Internet permits me to network with other like-minded people and exchange experiences, tips and ideas. My good blogging friend Mel Moore, writer of the Fishing Notebook, made me aware of a new angler networking website called GetReeled.com. GetReeled.com brings fishers together from around the world. To join you have to sign up and create your own account. It’s free. Ones you have your own account you can join other members or join groups. It’s a great way to talk with other anglers that share the same interests as you do. My home page at GetReeled.com can be viewed here and ones you joined the network we can engage in discussions about your favorite method of fishing or your favorite game fish species. 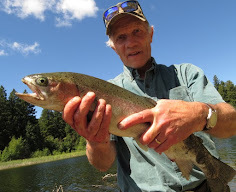 We also can talk about the fishing school where I offer lessons for individuals and groups in Merritt, British Columbia. If you’re, like me, a convinced Rapala lure user then you could join Mel’s Rapala’s Group like I did. We have some great discussions in that group about the effectiveness of using Rapala Lures for different fish species and different methods of fishing. I invite you to come along and do some fishing on the Internet, it’s great fun and you always can learn something new. Othmar I figured that I would give this a try so I sined up. o-ya I left you a comment on your profile. Thanks Deer Killer, I have seen the message and replied to it. I also added you as a friend. Welcome to Get Relled. GetREELed.com is great - it's the perfect place to blog and post info about fishing, tips, gear and see cool videos and photos from all over North America! And the GetREELed.com team just put together a brand new related site, the Ultimate Fishing Directory (www.ultimatefishingdirectory.com) so be sure to check that out too!